This product line is based on the latest pigment technology. The iridescent and brilliant interference colour line comes along with an unrivaled colour intensity. Based on a pure acrylic resin binder system it is lightfast and water-resistant. 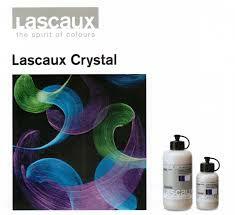 Lascaux Crystal are Iridescent effect colour with brilliance and luminosity. Subtle glimmer effects are achieved over light backgrounds, while dark grounds produce strong iridescent effects. Compatible with all Lascaux mediums and additives. Available in 85ml and 250ml bottles. For an information sheet on the Lascaux Crystal range click here to download the PDF file.